The Digital Output pressure sensors are based upon a proprietary surface mapping technology to produce a fully digital output that virtually eliminates all repeatable errors over temperature and pressure. This series provides a 12 bit digital serial output (14 bit in High Resolution Mode) with superior offset, span and linearity characteristics. The output is SPI and MICROWIRE/PLUS® compatible. 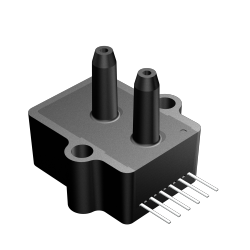 In addition to synchronous communications, the Digital Output pressure sensors incorporates a bi-directional, TTL level, asynchronous serial interfaces mode (hardware selectable 9,600 or 19,200 baud). This mode includes a command set that allows the host to interrogate the sensor for model information, pressure range, serial number, pressure units and conversion factor. The command set also allows the host to select a high resolution output mode, make minor adjustments to offset and has an addressable feature that alows multiple sensors to be tied to the same interface buss. This series is intended for use with non-corrosive, non-ionic working fluids such as air, dry gases and the like. All signals are 5V TTL/CMOS compatible.